- The German Shepherd - Also known as an Alsation, Deutsche Schaferhund and Berger Allemand. This is a large herding dog breed that originated in 1899 at Karlsruhe in Germany. Often you see this dog breed used as police dogs due to there obedience and intelligence. These dogs where specifically bred for their intellectual capabilities and the ability to learn commands very easily. The most popular color is black with tan markings but the breed does come in many different colours, the coat has also a variety of sizes althogh the preferred would be a double coat of medium length. This dog breed is well muscled, very agile, energetic, allways on alert and full of life. Althogh the dog has a distinct personality marked by a direct fearless with a full of self-confidence look it is approachable and fun-loving being very good with children, as soon as a relationship is established he will be loyal for ever being an excellent family or guard dog. 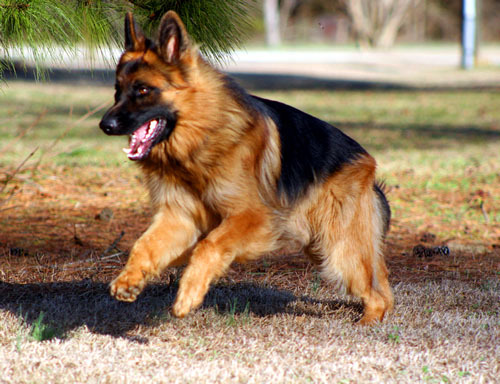 - Click here to know even more about the German Shepherd dog breed.